Good business premises are a great way to make the right first impression on visitors, whether they are candidates applying to work for you, potential clients, or even investors you hope to entice some money out of. 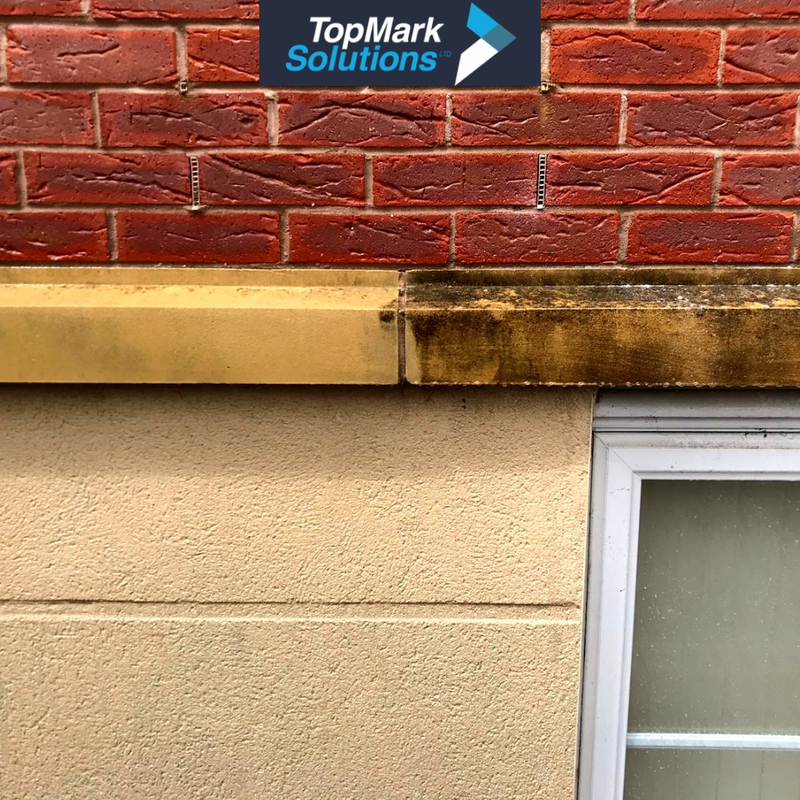 So it’s a smart investment of your own to keep your premises spruced up and looking at their best – which is where Top Mark Solutions’ render cleaning and stone sill cleaning services can help. Exposure to inclement weather conditions. Growth of algae and moss in wet weather. Discolouration due to exposure to air pollution. Business properties in particular can be at higher risk as they might be more likely to have large areas of external render or cladding, and are often located in places with higher traffic pollution. With our business premises cladding cleaning service, we can soon have your render restored much more closely to its original colour and vibrancy – and most crucially of all, leave it looking much cleaner. Our equipment is state of the art and we use the industry’s highest rated render cleaning products, putting all of our experience and expertise into giving you the highest possible standard of finish. It’s important not to miss the fine details, as one small area left dirty can destroy the overall visual effect, which is why we offer stone sill cleaning services to complement our cladding cleaning service. Often the stone sills and window lintels are left exposed when the rest of the wall is rendered, particularly on older buildings where they can be considered an attractive visual feature – at least when they are clean. We can remove not just surface dirt, but deeply ingrained staining that has worked its way beneath the porous surface of natural stone sills, as our hot water pressure hoses penetrate the top layers without damaging the stone itself. Render restored to its original colour and attractive cleanliness. Natural stone sills free from patchy stains and discolouration. Zero clean-up – just freshly cleaned exteriors ready for your next visitors to see. We work quickly and safely, using technology that reduces the amount of water required and heats the jet to a high temperature for even more effective surface penetration and deep cleaning. To find out more about our surface render cleaning and/or our natural stone sill cleaning services, give us a call today for a no-obligation quote based on exactly what work you need carrying out.